Cheap Accommodation Zaza Backpackers Hostel & Guesthouse in Seoul Korea. Zaza Backpackers Hostel is a brand new Guesthouse in Seoul, Korea. The Zaza Backapckers hostel in Seoul serves you with our great location, as the most centrally located guesthouse in Seoul. We provide all the other customer-friendly facilities with private rest rooms, shared kitchen, free-wifi and so on. It is an easy walk to Seoul's most famous attractions including Myeong dong shopping st, Dongdaemun Market, Seoul N-Tower, Namdaemun Market, Palace, Insadong, Cheonggyecheon Stream, City-hall and Seoul Station. We are just a 3 minute walk to a subway station and the airport bus stop, which make it easy to get to Incheon Airport and attractions such as very famous Hongik Univ. 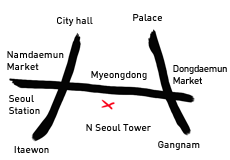 area , Daehakro area and National Museum. It's all on your doorstep when you stay with us. Our very friendly staffs are more than happy to show you how to get around.